Eion Francis Hamilton Bailey is an American actor, perhaps best known for appearing in the HBO miniseries Band of Brothers as Pvt. David Kenyon Webster and in the films Fight Club, Center Stage, Mindhunters and Sexual Life. He currently has a recurring role on the USA Network TV show Covert Affairs. 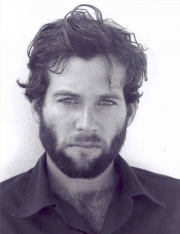 Eion Bailey grew up in the Santa Ynez Valley of California. His father owned a small airline service which flew people around the state. Eion tagged along on flights and his father gave him flying lessons after dropping off passengers. His first lesson was at the age of twelve. When not flying or playing baseball, Eion and his friends frequented Solvang, a small tourist town nearby. He struggled in school until he found his calling in his high school drama department. Eion was soon performing in each school play and went on to study formally at the American Academy of Dramatic Arts in New York City. Bailey also briefly attended Santa Barbara City College. In 2007, Bailey was awarded a Daytime Emmy for his performance in the television movie Life of the Party. Bailey has also had recurring guest-starring roles on the TV series Dawson's Creek and ER. Whole or part of the information contained in this card come from the Wikipedia article "Eion Bailey", licensed under CC-BY-SA full list of contributors here.